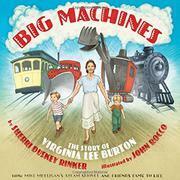 Virginia Lee Burton’s big machines roar to new life in a new biography of the author. Rinker, author of Goodnight, Goodnight Construction Site (2014; illustrated by Tom Lichtenheld), is right at home describing the life and times of big machines. “Ting, Ting, Ting!...CLINGETY-CLANG!” comes Maybelle the cable car. “CHUG! CHUG! CHUG!” says Katy the crawler tractor as she digs her way through a double-page spread of snow. Clearly a labor of love for Rocco, the illustrations demonstrate the same care for book design evident in Burton’s work. Endpapers depict Burton’s Little House encircled by big machines, an effect akin to the block-printed fabrics of the Folly Cove design group the illustrator worked with in Massachusetts. Rocco’s illustrations capture the look, personality, and energy of the machines without being overly imitative, and he offers playful departures, such as the final double-page spread featuring a spirited procession of Choo Choo, Mary Anne the steam shovel, Katy, and Maybelle as “their stories come to life…quite magically… / for Aris and Michael,” Burton’s sons, represented as her inspirations. The beautiful symbiosis of text and art works on several levels—as a biography, a study of the artist’s creative process, and a demonstration of the themes of change and survival evident in Burton’s picture books.